Speed matters in metal fabrication, because the faster we can get jobs delivered the happier our customers are. And it doesn’t hurt that we can get more work through our shop too! So when technology arrives that promises 100% faster metal cutting we sit up and pay attention. That’s the claim for direct diode laser cutting. We took a look to see if the claim rings true, and here’s what we learned. A laser produces a beam of coherent light. Basically, that means a lot of energy is packed into a thin beam that shines at a single wavelength. Focus that beam down to a few thousandths of an inch diameter, crank up the power to 1,000 W or more, and you can melt metal, on one condition: the metal must absorb rather than reflect the energy. Absorption is related to the wavelength of the light. Metals absorb some wavelengths of light more readily than others. (That which isn’t absorbed gets reflected.) Aluminum for example has a spike in absorption at 970nm. So for the fastest melting the laser wavelength should be matched to the characteristics of the metal. In laser cutting machines like ours the laser light is taken to a cutting head mounted on a gantry. This gantry can move over a sheet of metal in one direction while the cutting head provides a second axis of motion. Inside the head optics focus the beam down to a spot on the sheet. Early laser cutting machines used CO2 lasers that cut with light of 10 microns wavelength (far into the infrared.) Recent years have seen this technology replaced by fiber lasers operating at around 1 micron wavelength. Fiber lasers generate the beam within an optical fiber. This produces a high quality beam readily focused down to a small spot, letting a fiber laser cut two to three times faster than the same power of CO2laser. Fiber lasers do have a couple of limitations. First, the fiber laser itself is very sensitive to reflections, so they are not suitable for materials like aluminum, copper and brass. And second, on thicker materials cut edge quality is rougher than that produced by CO2 lasers. Diode lasers are actually very common. Every laser pointer uses the technology, (which at it’s heart is similar to that of light-emitting diodes.) Until recently achieving enough power to cut metal was impractical, but advances in diode manufacturing and optics have changed that picture. A Direct Diode Laser (DDL) cutting machine combines the light from multiple diodes into a single collimated beam of coherent light and directs it right at the workpiece. Eliminating the fiber system makes these lasers far more efficient, (in terms of power in to power out) than their fiber equivalents. It also eliminates reflection sensitivity, so enabling cutting of aluminum and copper. Superior beam quality results in cutting speeds some 10 – 20% faster on most metals than is achievable by fiber lasers, with one exception: aluminum. 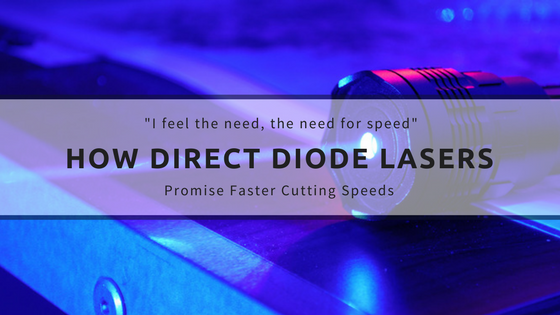 Since the DDL wavelength is more readily absorbed by aluminum, on this metal cutting speeds are 100% higher. Another benefit of the beam is better edge quality on thicker materials. In Top Gun it was Kelly McGillis who took Tom Cruise’s breath away, but we’re manufacturing nerds, and it’s cool lasers that do it for us. Laser cutting is an excellent way of cutting complex shapes from sheet metal and DDL promises to help us do that even faster. Then we’ll feel like we’re going Mach 2 with our hair on fire.